When sending out a direct mail piece in an envelope, here are three ways to increase the return on your investment without increasing your budget. 1. Use a font that resembles natural handwriting to address the recipient’s name and address. 2. Go one step further, and use the same font to print your return address in the upper left corner. 3. Use a stamp (not indicia). If you’re using a mail house, you are already paying for addressing, so have them print in high-resolution using a handwriting font that really looks like it was hand addressed. You can even select an ink color so it looks like a pen was used. The postage you pay is the same whether you use an indicia or stamp, so why not go one step further and make sure your piece is stamped? You can use a bulk-rate stamp, non-profit stamp, first-class presort stamp or first-class stamp. The result will be a direct mail piece that doesn’t look like junk mail. When you go through your own mail, you quickly scan through to see if there’s anything important and your customers do the same (or they have a secretary that does it for them). 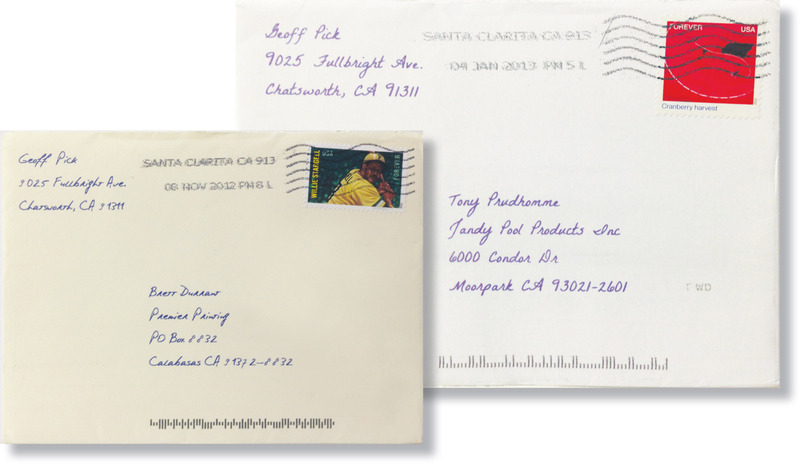 A hand-addressed, stamped envelope will almost always be opened first. Why? It looks personal. Maybe it’s a birthday card, a note from someone special or something that requires your immediate attention. It will be opened. On your next mailer, make sure you apply these steps and see how it boosts the response of your campaign. There’s nothing to lose, but a lot to be gained. Clear Print has a selection of high-res fonts to choose from that look like real handwriting – especially when printed with blue ink. To see samples, get more information or get a quote please call (818) 709-1220 or email info@clearprint.com. You can also come by, we’re located in Chatsworth in the west San Fernando Valley and service Los Angeles, Santa Clarita, Valencia, Westlake Village, etc.